Stub your toe and get a paper cut in the same day and if your like me you catch yourself wondering what’s going to happen to your body next. A girlfriend shares their joyous news of a surprise pregnancy and your scouring Facebook to see who else was bitten by the stork or had a glass of tainted water. Well, lately it’s been electronics that have bitten the dust. It started with a fickle toaster. Refusing to work 75% of the time it would work if by fluke you found the one electrical receptacle in the kitchen out of 7. I had to Unplug the toaster and try a new spot. Eventually I became paranoid that just moving the toaster would force it to stop all together so begrudgingly I left it plugged in beside my mixer and the very next time I moved the toaster was its last. Then if you remember it was our toilet & our Front-loading washer. After a rather frustrating week I was looked forward to curling up on the couch with a bowl of ice cream in one hand and the remote in the other. What a great way to unwind and catch up on some of my favorite shows. Apparently my TV had other plans for my evening. After sitting on the phone for over an hour with one of the “gateway ninjas” it was decided that our main Shaw gateway portal was acting fickle too and needed special attention. so a service appointment was slated for today BUT because the portal downstairs worked just fine we could in theory watch TV so our weekend wasn’t a total write off. Notice I said “in theory”. Except for one wee problem. 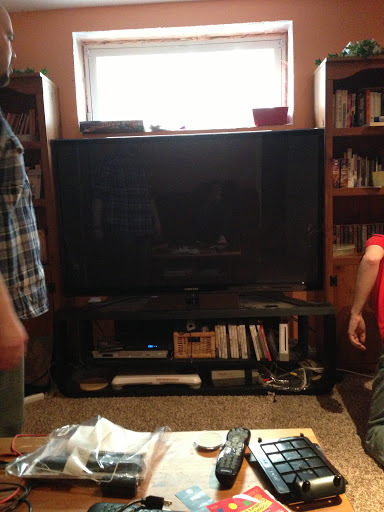 Our rear projection TV decided that after six short years that enough was enough thank you and it was time to die. So to recap: we have a TV upstairs that works but the portal doesn’t and a TV downstairs that doesn’t work but the portal does. It’s so ridiculous I couldn’t decide If I wanted to laugh or cry! We missed the golf show to search for a replacement TV. Big purchases always leave me feeling ill.
Plus I’m not super techie so its not a big whoop whoop to me if it’s 64″ plasma smart TV with 3d capabilities. I just want to watch it. Besides buying a TV you have to jump through more hoops then a cute pair of pumps. Throw in a crazy work schedule of one teenager and only one vehicle we had to juggle a few things in order to figure out how we were going to transporting the new TV home. I took the truck to get niffy nunu and big daddy &our new TV hitched a ride with friends. I had the house keys leaving my hubby waiting on the steps. If that wasn’t enough they wrestled the old TV up from the basement and then pull the new one out of the box to set it up then carry it downstairs to its new home. As much as a thrill a new TV brings its kind of a pain! especially with all the leftover Styrofoam and a monstrous cardboard box. 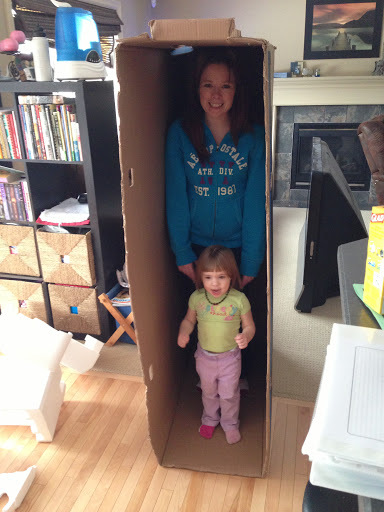 We let the kids play in the box and I even got into it as well. We watched a little TV. Ok, maybe a lot of TV but when the thing comes with 3d glass you have to check it out right? less than two days of enjoyment and our fancy shmancy new TV decided to joined its predecessor and we were shown the black screen of death. Seriously, I could even make this crap up. Which means that after work tonight we have to unplug & repack the “new” TV and exchange it for a brand new one that works. I don’t know if I should laugh or cry! Thankfully the “shaw gateway ninjas” have fixed the TV upstairs so at least one TV in our house works. I’m ashamed to admit it but this entire experience showed me how dependent I am on my TV. Even if I don’t watch it as often as I thought I did. I was at a complete loss to what to do. I’m still shaking my head over that one….